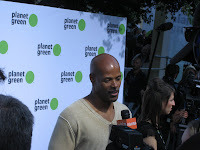 On June 4th a new channel from Discovery, Planet Green, becomes the first-ever 24-hour television network dedicated solely to green issues, lifestyle and entertainment programming. General Motors is a sponsor of the new network and since GM is a client from our Detroit office they were my ticket into the channel's premiere out here in L.A. I was also asked to cover the event and speak with some GM and Discovery executives for their GM Next blog--the resulting piece should appear next week, I'll post a link once it does. Anyway, the premiere party was held at The Greek Theatre, way up in the Hollywood hills. 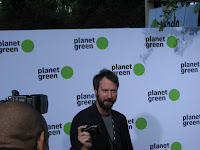 A green carpet made of AGL artificial grass from recycled polyethylene (saves water and it looked real), was laid out for the celeb guest arrivals, which included Tom Green (he made the joke that he was born "green," lol), Keenen Ivory Wayans, Entourage's Adrian Grenier and a few others from High School Musical and actors I didn't really recognize--too new. 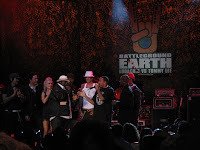 Being filmed that night was the channel’s finale of Battleground Earth Ludacris VS Tommy Lee with a concert by the two musicians who competed against each other over the last 40 days in green challenges. Other special guest performances included Train, Switchfoot, members of Velvet Revolver, Ziggy Marley, Bowling for Soup ("1985"), Too Short, Blue Man Group (I'm so not into it, I think it's more of a guy thing), Robbie Krieger from the Doors (cool to see a legend like that perform), Billy Gibbons from ZZ Top and the energetic Dee Snider from Twisted Sister. Songs like Train's "Calling All Angels" and Snider's "We're Not Going to Take It" tied in nicely with the green theme as did most of the songs actually. Proceeds benefited the fund created to restore areas destroyed by recent wildfires in and around Griffith Park, which is right next to the theater. We also got to see clips of the show Battleground Earth, which looked really entertaining. I actually think I'll DVR it when it premiers in August, after all Desperate Housewives is over now. Considering this was a benefit for going green, I only spotted one hybrid in the vast parking lot, not that I could talk pulling up with Raphael's V8 engine. 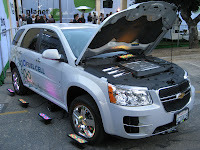 However, on display at the end of the green carpet was a Chevy Equinox Hydrogen Fuel Cell Vehicle, where a lot of onlookers peeked under the hood and took pictures in front of the spiffy car. I had the chance to sit in the driver’s seat of the Chevy Equinox and conduct a brief interview with the vice president of GM North America. (The car meanwhile had very comfy seats and of course had that new car smell). 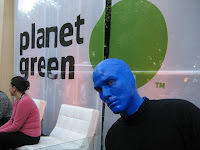 Thank God I'm not the only one who doesn't get Blue Man Group. I got a free ticket to their concert a few months ago and I was not that impressed. I figured I *should* be impressed, but I wasn't. Oh well. hey, is that tobias funke in the top pic of this blog? hahahaha!